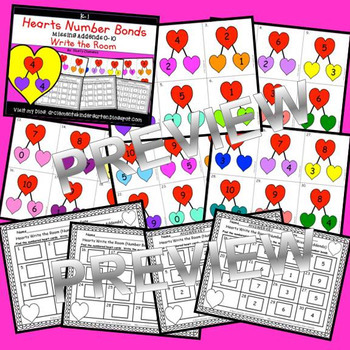 This resource includes five pages of numbered heart cards in color with a total of 30 Heart cards. Each numbered heart card has a number bond with one addend missing. Teachers should copy the heart cards on cardstock (for durability and saving for future years) or plain paper, laminate (if desired), cut apart, and then post the heart cards around the room. If you don't want students walking around the room, the heart cards can be put in a center such as at a math center or in a pocket chart. Depending on how many cards you want to use, you can post/use heart cards number 1-15, heart cards number 16-30, or all 30 cards at once. Numbers 0-10 are used for missing addends of all 30 heart cards. There are two recording sheets. One is for heart cards numbered 1-15 and one is for heart cards numbered 16-30. Students can complete one or both recording sheets when in their center depending on how many cards you post. Students will get a recording sheet with boxes to write 15 numbers or both recording sheets can be stapled together when working on all 30 cards. Students will roam the room to find the heart cards. After finding a card, the student will look at the number on the card, find the matching number on their recording sheet, and write the number (numeral) to complete the number bond (missing addend). 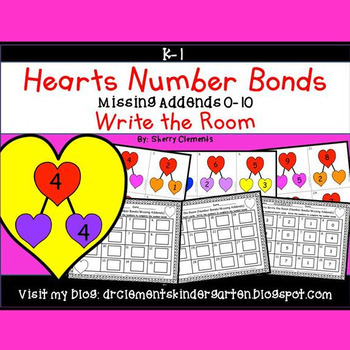 Example: Heart card number one has the whole number 3 with addend 0 and the other addend is missing, so students will write the number (numeral) 3 on their recording sheet in the number one box because 3 completes the number bond showing that 3 and 0 make 3. Answer keys are provided for the recording sheets either as a self-check for students or for the teacher to have an answer key to quickly check papers. ***There are 9 total pages including two answer keys: 5 heart card pages, 2 recording sheets, and 2 answer keys to the recording sheets. This activity is great for a math center. I hope your students have fun with this "Write the Room" activity for number bonds.